**Price of workshop includes tickets to sensory friendly shows afterward: Magic and Comedy Show and Irregular Nonsense, Stomping Ground’s improv group made up of all individuals with Autism. Whether your child loves to perform or shies away from the spotlight, improvisational comedy techniques and music can enrich their lives and boost their confidence. Improv exercises and music lessons encourage emotional awareness, self-confidence, social and communication skills, self-expression, and creativity. In this interactive and fun workshop, students are introduced to the basics of improv and music technology. 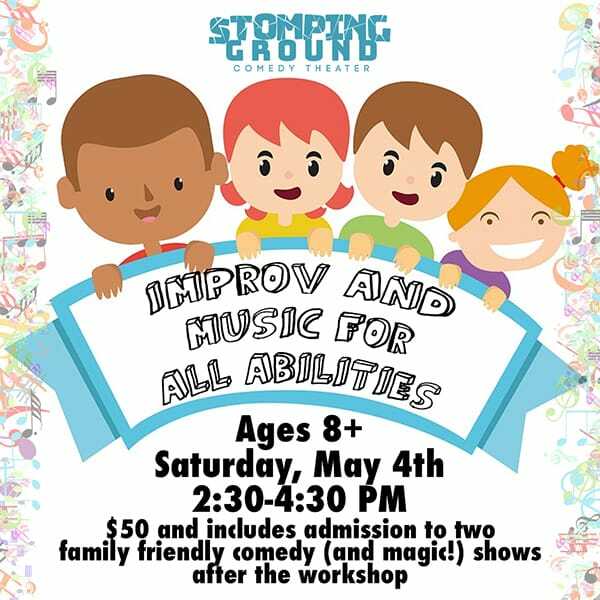 This class is taught by Stomping Ground’s Improv for Life Instructor, Greg Silva and Music, Special Education teacher, and Special Needs Advocate, Erika Warren, thespecialneedsadvocate.com. Stomping Ground volunteer instructors include Speech Therapist and Improviser, Lisa Belcher and Comedy Performer and Improviser, Taylor Rexrode. No improv experience necessary; beginners welcome. This class is appropriate for all kids, teens, and adults who are able to be left without their guardian in the workshop and who are non-aggressive. For questions or concerns, email Andrea@stompinggroundcomedy.org.